Qui Nguyen raises to 5,700,000 on the button and Gordon Vayo calls from the big blind. The flop is and Vayo checks. Nguyen bets 9,700,000 and Vayo folds. 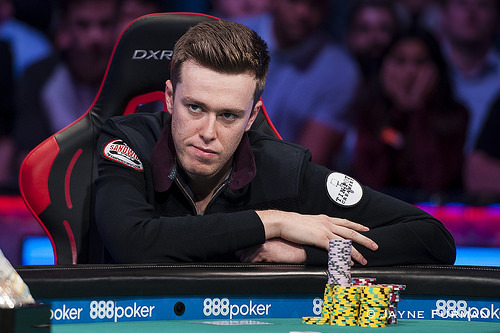 Gordon Vayo raises to 5,000,000 on the button and Qui Nguyen three-bets to 14,900,000. 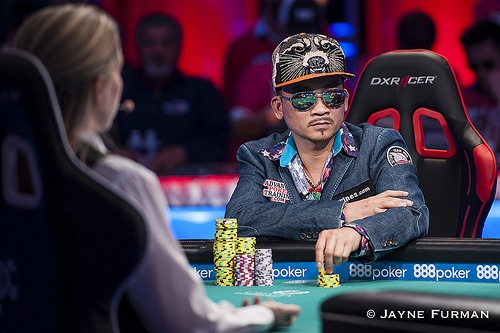 Vayo moves all in for 58,600,000 and Nguyen asks the dealer for an exact count. Nguyen calls. Vayo shows and is in the lead against Nguyen's . Their collective rails got on their feet and begin to cheer and call for specific cards. The flop is and Vayo's ace-high keeps the lead, leaving Nguyen drawing to a king, a nine, or running cards to make a flush or straight. The turn is the and Vayo is one card away from a double up. The river is the and Vayo doubles up. 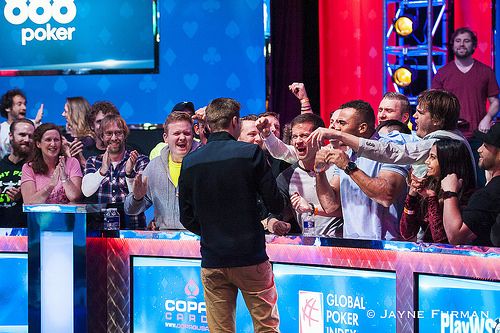 Vayo's rail gets as loud as they have been all day and begins a "Gordon" chant while the dealer pushes Vayo the pot. Gordon Vayo gets a walk. 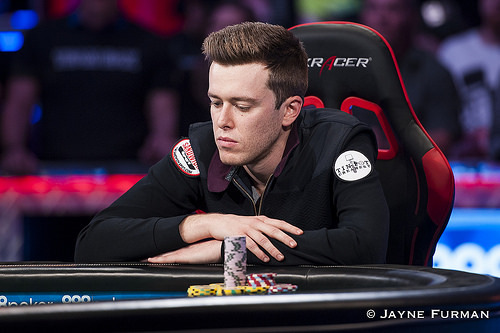 Gordon Vayo raises to 5,000,000 on the button and Qui Nguyen three-bets to 14,900,000 out of the big blind. Vayo calls and the flop is . 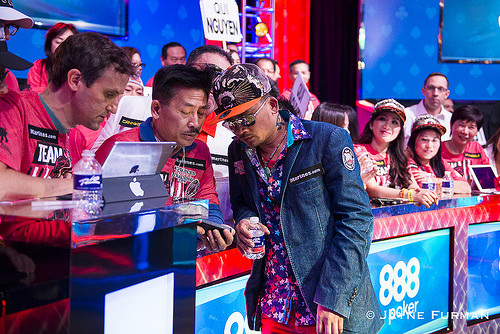 Nguyen bets 17,900,000 and Vayo takes a couple minutes before calling. There is over 66 million in the pot as the comes on the turn. Nguyen checks and Vayo checks behind. The crowd collectively groans as the comes on the river. 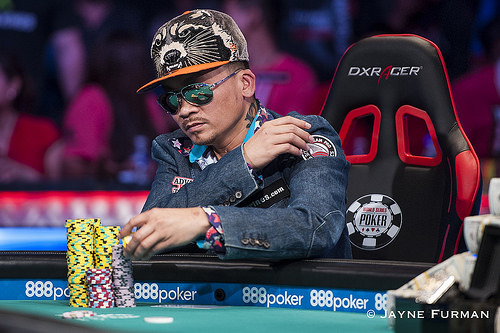 Nguyen moves all in for effectively Vayo's remaining 57,600,000. Vayo takes a minute of deliberation and folds. Nguyen takes the pot and his crowd erupts with cheers. Qui Nguyen raises to 4,700,000 on the button and Gordon Vayo calls from the big blind. The flop is and Vayo checks. Nguyen checks as well and the comes on the turn. 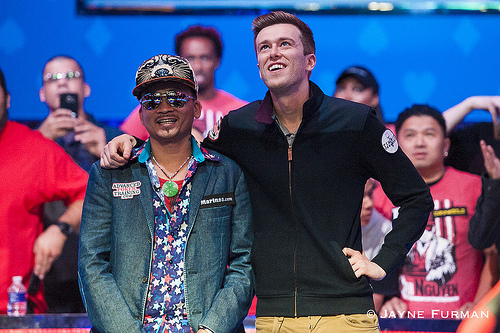 Vayo checks again and Nguyen bets 7,800,000. Vayo folds and Nguyen takes the pot. 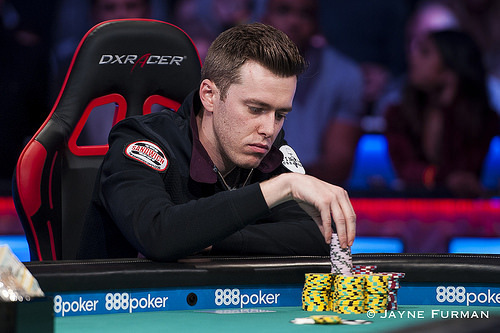 Gordon Vayo raises to 5,000,000 on the button and Qui Nguyen folds. Qui Nguyen raises to 5,700,000 on the button and Gordon Vayo folds the big blind. Players are taking a 10-minute break. Gordon Vayo raises to 4,000,000 on the button and Qui Nguyen calls from the big blind. The flop is and Nguyen checks. Vayo checks back and the comes on the turn. Nguyen bets 7,700,000 and Vayo folds. Qui Nguyen raises to 4,700,000 on the button and Gordon Vayo folds. Qui Nguyen raises to 4,300,000 on the button and Gordon Vayo calls from the big blind. The flop is and Vayo checks. Nguyen checks behind and the turn is the . Vayo checks and Nguyen checks as well. The river is the . Both players check again. Vayo shows , good for a straight, and Nguyen mucks his hand. 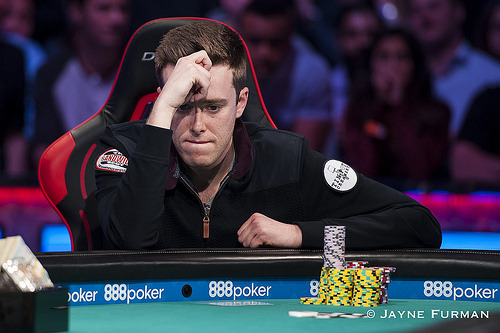 Gordon Vayo raises to 4,000,000 on the button and Qui Nguyen folds. 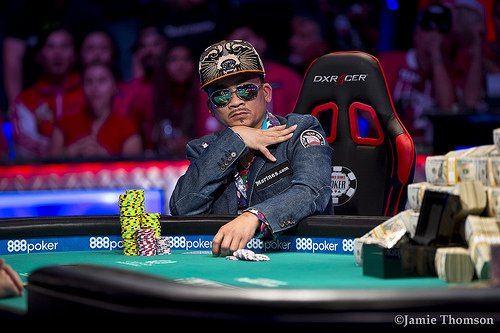 Qui Nguyen raises to 5,800,000 on the button and Gordon Vayo calls from the big blind. The flop is and Vayo checks. Nguyen checks behind and the comes on the turn. Vayo leads out for 5,700,000 and Nguyen min-raises to 11,400,000. Vayo calls and the river is the . 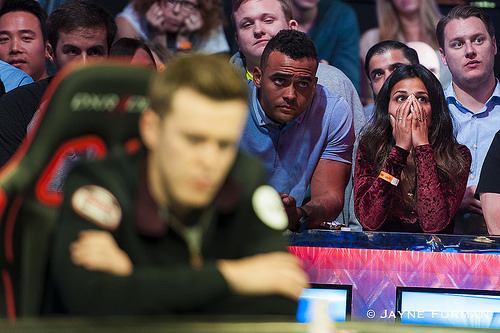 Vayo checks and Nguyen bets 25,700,000, which is more than a quarter of Vayo's remaining stack. Vayo folds and Nguyen takes the pot. Qui Nguyen raises to 4,000,000 on the button and Gordon Vayo folds. Vayo checks behind and the turn is the . Nguyen checks. Vayo checks as well and the river is the . Nguyen bets 5,700,000. Vayo calls and Nguyen shows . Vayo mucks his hand and Nguyen wins the pot with jacks and eights. Vayo checks behind and the turn is the . Nguyen checks and Vayo checks as well. The comes on the river. Both players check again. Nguyen shows and Gordon wins the pot with .